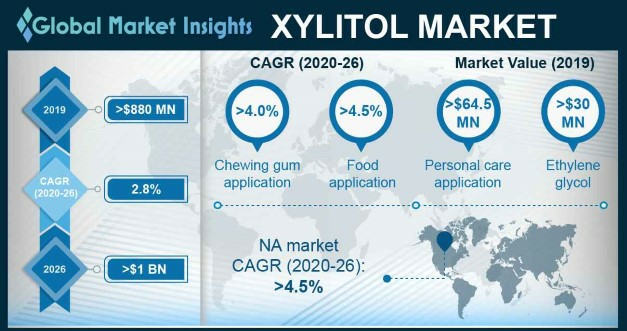 Propylene Glycol « Global Market Insights, Inc. Endorsed by the rapidly growing automotive sector and the strong commercial air traffic flow across major geographies, antifreeze market has indeed accomplished appreciable gains in the recent years. Colloquially known as coolant, antifreeze is popularly used in automotive and aerospace engines for maintaining the overall engine temperature of the vehicle and its cooling system depending upon the atmospheric temperature. Using antifreeze efficiently helps to majorly enhance the engine performance, on the grounds of which many automakers have been giving extensive preference for the product to prevent freezing in the cooling engine of the automobile at a sub-zero temperature. Anti-freeze not only prevents corrosion and scale formation in the engine but also helps to improve its capability to transfer heat. Consequently, major antifreeze industry giants have been continuously enhancing their product efficiency and applicability. In fact, increasing popularity of engine cooling agents among several automakers has been primarily forecast to boost antifreeze market share over the years ahead. Currently, it has been observed that many automakers have framed different coolant specifications for various types of engine applications, which have been proving to be rather beneficial for antifreeze market. For instance, one of the renowned automakers, Volvo has set a new coolant specification for heavy duty engines, which are mainly used in marine, buses, HGVs, and power plant applications. Indeed, one of the leading lubricant manufacturers Exol, in order to meet the favorable requirements of the Volvo Coolant Specification standard, has also launched novel antifreeze products. The company also seems to have unveiled a wide range of antifreeze products for passenger and heavy-duty vehicle applications. Apparently, Exol has used the OAT inhibitor technology for this range, in order to match the automaker’s expectation with respect to the advanced technology in modern cooling systems in next-generation vehicles. Exol’s product innovation is indicative of the major anticipations that automotive giants have from pivotal antifreeze market players. Moreover, in order to ensure year-round protection of vehicle components in challenging atmospheric conditions, automakers have lately been preferring coolants with a long operational life. The shifting focus of product manufacturers on customer-centric requirements is thus slated to stimulate antifreeze industry outlook over the years ahead. Considering the customer’s requirement for internal coolants with a long shelf life, many players in antifreeze market are constantly looking forward to introducing the best products that boast of very high performance. In addition, with the rapid change in engine technology, most companies have been developing new products keeping in mind the future demand of engine maintenance. The initiatives taken by Shell lubricants to expand its portfolio is one of the recent examples of a customer-centric product advancement carried out by giants in antifreeze market. The new launch – Shell Rotella Extended Life Coolant – Nitrite Free (ELC NF) joins Shell’s coolant portfolio that has been designed to meet the requirements of commercial vehicles deploying nitrite free engine antifreeze formulations to protect aluminum components in automobiles. Indeed, in 2016, the automotive sector accounted for 60% of antifreeze industry share. 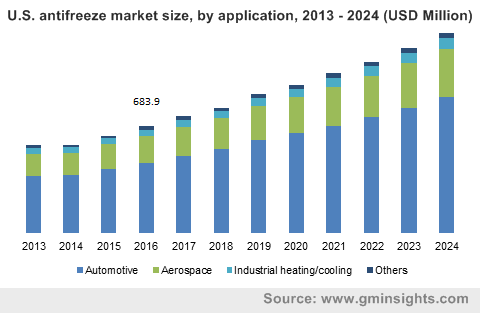 It is very interesting to note that most participants in antifreeze market have been extensively adopting the OAT technology to fulfill the increasing product demand from the automotive sector. In consequence, this trend has been having an appreciable impact on antifreeze industry outlook. Indeed, many players in antifreeze market have been pouring in substantial capital to consolidate their stance in this business space. Some of the most noteworthy players in antifreeze industry are Exxon Mobil Corporation, Royal Dutch Shell, Ashland Inc., and Castrol. This entry was posted in Polymers and Advanced Materials and tagged Antifreeze industry, Antifreeze industry analysis, Antifreeze Inorganic Acid Technology, Antifreeze Market, Antifreeze Market forecast, Antifreeze Market growth, Antifreeze Market outlook, Antifreeze Market PDF, Antifreeze Market report, Antifreeze Market share, Antifreeze Market size, Antifreeze Market trends, Ethylene Glycol, Organic Acid Technology, Propylene Glycol.